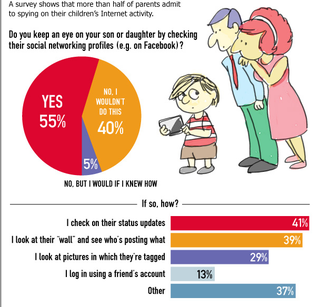 According to a survey, 55% of parents "keep an eye" on their kids by checking out the status updates, wall posts, and tagged photos on their social networking profiles. The other 40% said they don't spy on their kids at all and the remaining 5% said they would spy on their kids if only they knew how to do that. When asked to explain their behavior, 36-percent blamed their "overprotective" parental instincts, where as 14-percent said they were just being "nosey". A sad 24-percent confessed that Facebook was the only way they could find out what their sons and daughters were up to, while 6-percent found that the social networking site allowed them to avoid having "awkward conversations" with their offspring. I'm not sure how looking at your child's Facebook profile would make for less awkward conversations, but as we all know, these studies never lie.